In December, Tawn’s university friend Ko was married. Tawn and several of their close friends helped with various aspects of the wedding. For example, Tawn served as the emcee both in Thai and English, since the groom’s family are from Sweden. 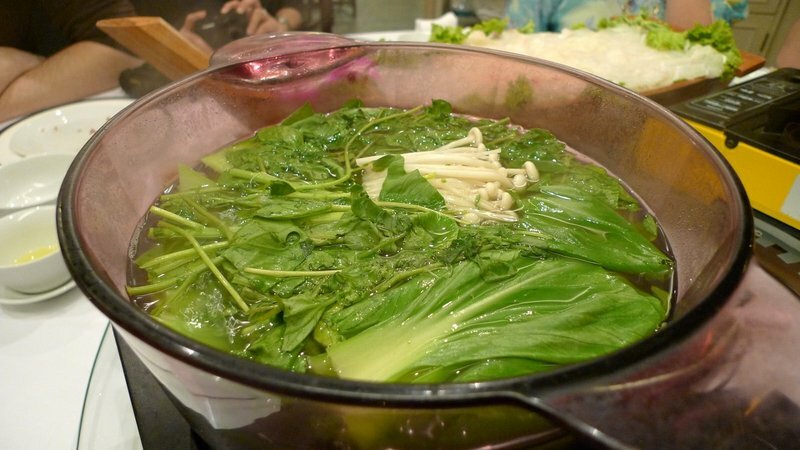 As a thank-you, Ko’s mother took the friends (and me) out for a very nice dinner at the Grand Shangarila Restaurant, an old-school Chinese restaurant in the Silom area known for their seafood hot pot and lobster sashimi. 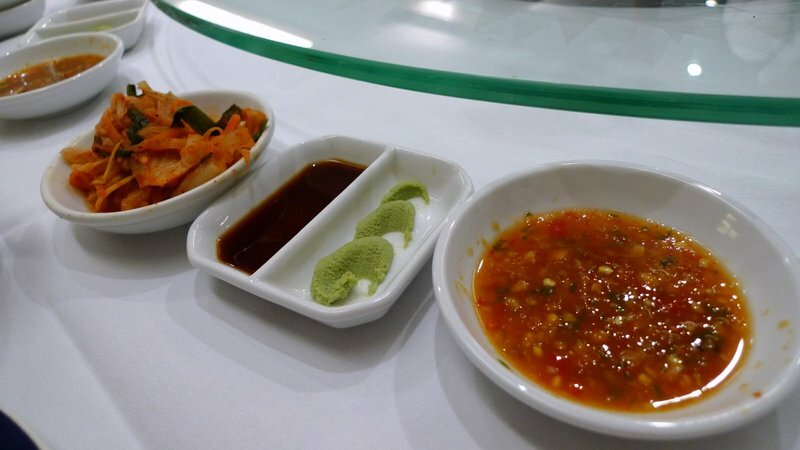 A choice of sauces and condiments: kimchee, soy sauce, wasabi, and Thai style dipping sauce. Korean, Japanese, and Thai all in one row. 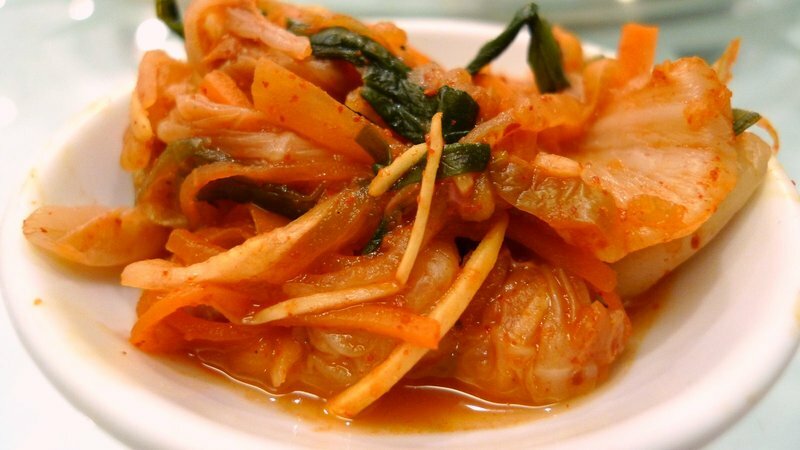 Look at the beautiful kimchee! 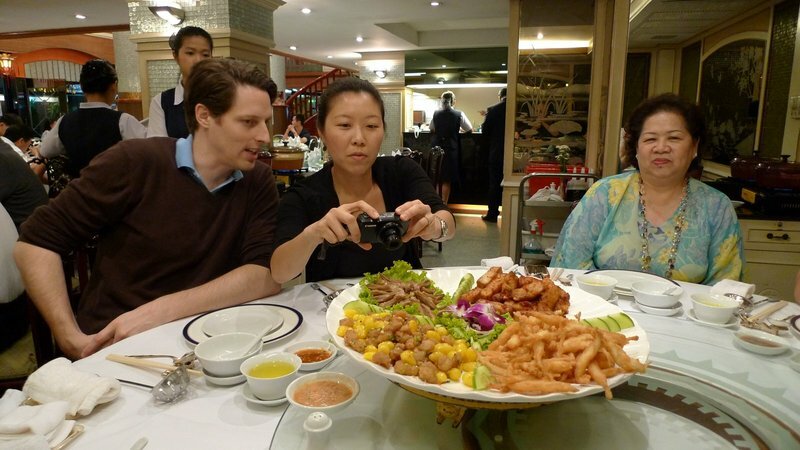 Newlyweds Per and Ko take pictures of the appetizer plate, while Ko’s mother looks on. 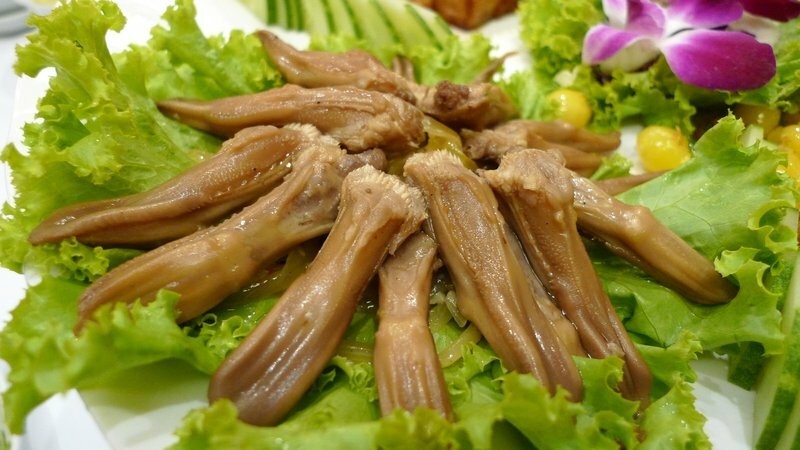 If you guessed duck tongue, you would be correct. There’s a little cartilage spine in them after you eat the meat. Who knew? Tasty, though. A lovely roast duck was brought to the table and presented to us, then the staff carved the crispy sweet skin off and wrapped the skin in these delicate crepes with plum sauce and green onion inside. 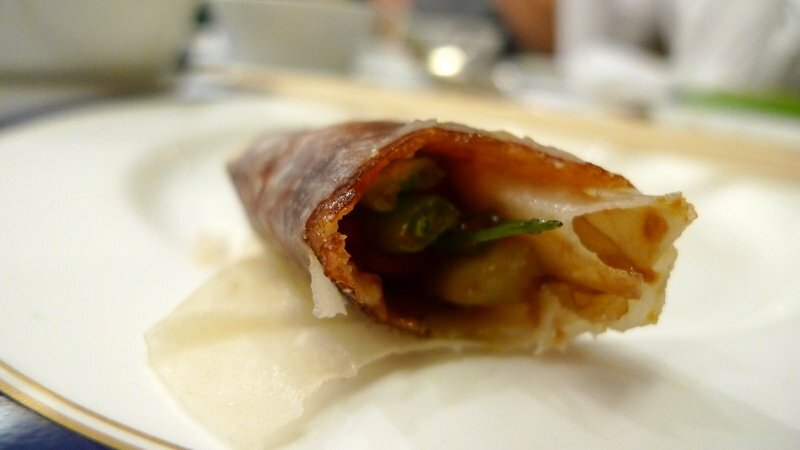 Close-up view of the crispy goodness of roasted duck skin. 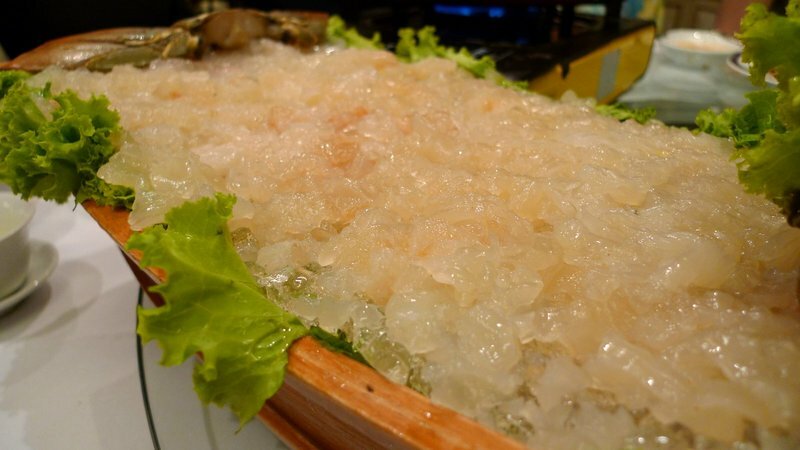 The sweet meat, which we could either boil briefly in a broth and eat, or simply eat raw after a brush of soy sauce. In my opinion, raw was the better option as it was tastier. My goofy husband pretending to be impaled on the lobster. 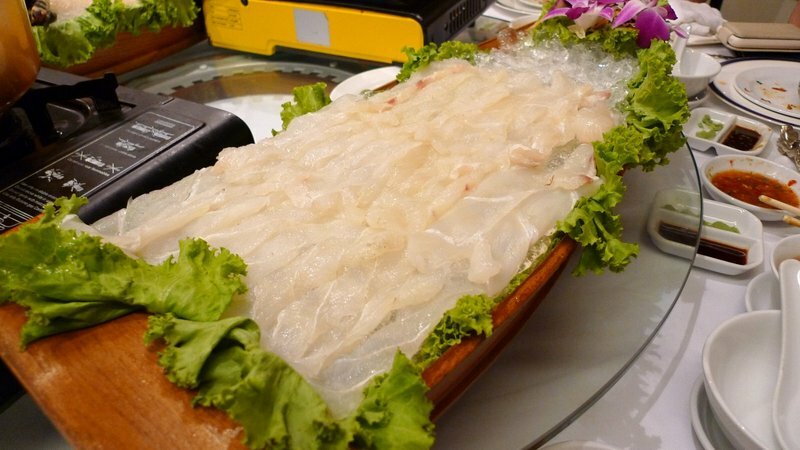 Also served was a boat of sashimi dragon fish, a firm white fish that was boiled in another broth. 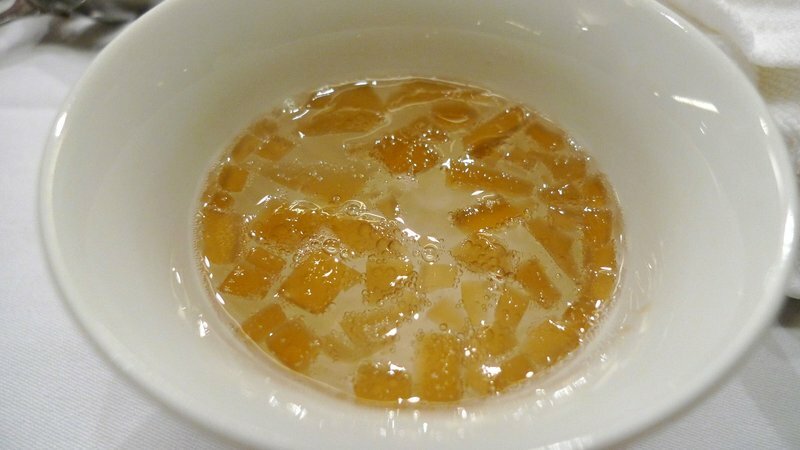 There were two broths, one made from some of the lobster’s blood and Chinese cooking wine and another from the fish bones. Don’t mix! Also served with the lobster was a little bowl of – any guesses? A gelatin made from the lobster’s blood, with Sprite poured over it. Odd… didn’t understand the point of this. 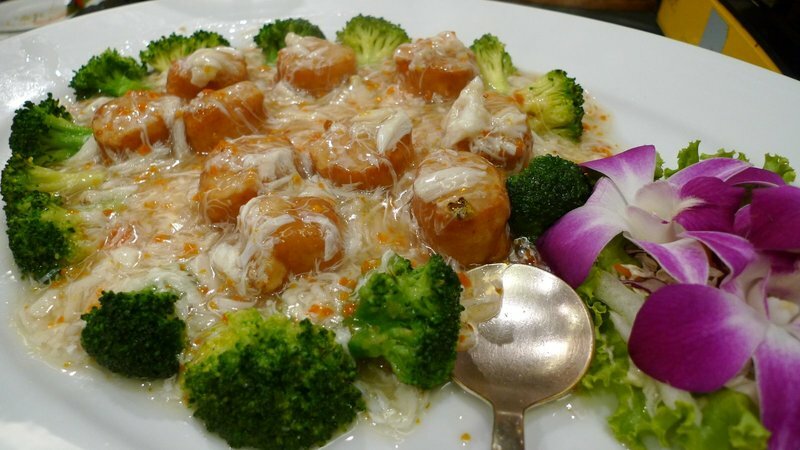 It is meant to be a chased to the lobster and the gelatin was pleasantly salty. But no idea why the Sprite was in it. 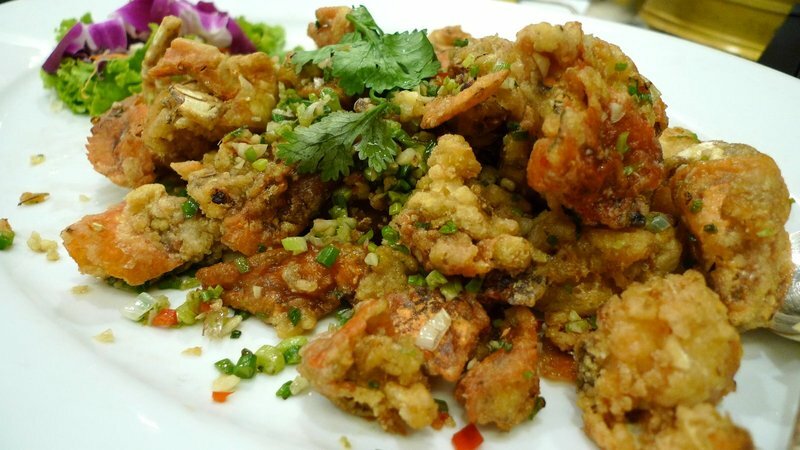 Fried soft shell crab with black pepper and salt, garlic, scallions, and chilies. 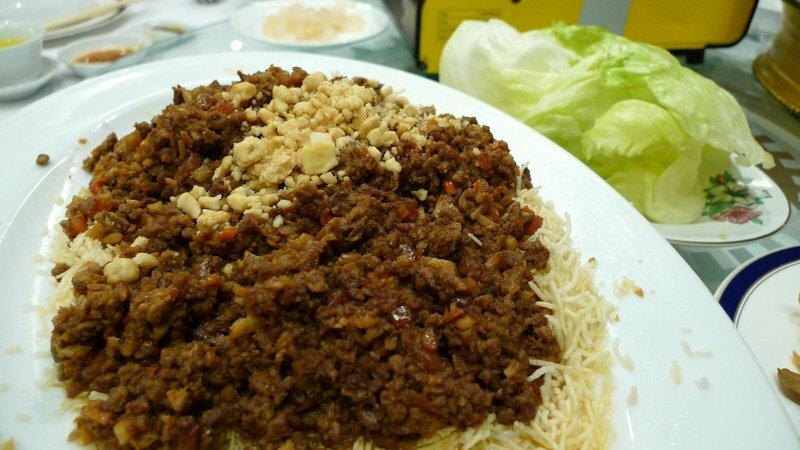 The remaining roast duck meat made its way back to the table as a stir fry served on a bed of crunchy fried vermicelli noodles. 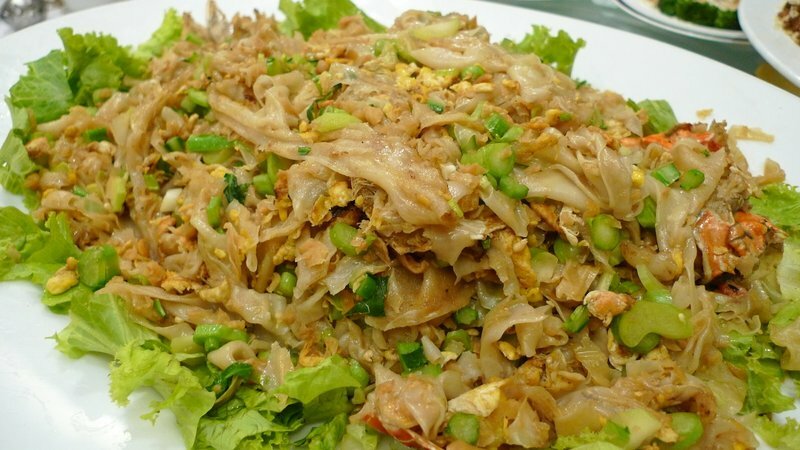 Fried wide rice noodles with lobster head. 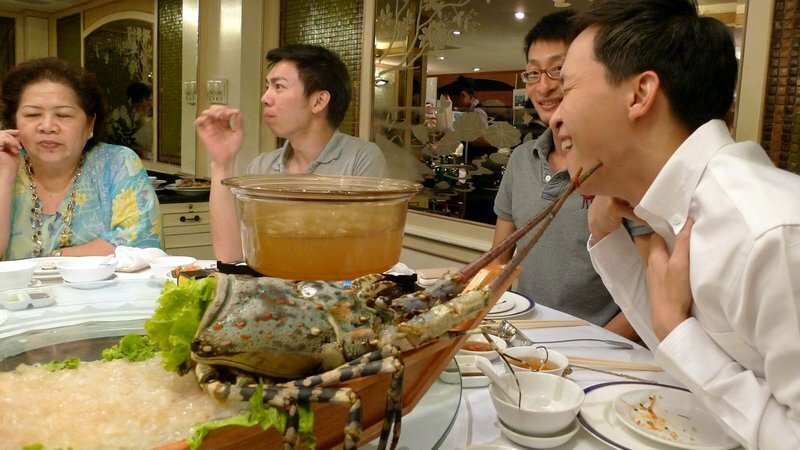 Ultimately, the entire lobster that was first served as sashimi is consumed over several courses. 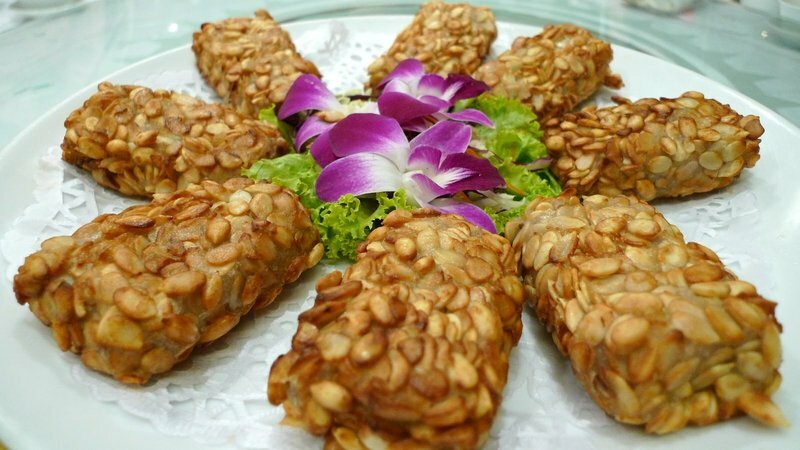 Dessert number one was a taro paste bar with ginkgo nuts wrapped in pumpkin seeds and fried. Dessert number two is fresh young coconut meat and ginkgo nuts served in a light sugar syrup. Needless to say, this was a pretty fancy – and filling! – meal. We were really treated wonderfully by Ko’s mother and went home with several containers of leftovers per person. 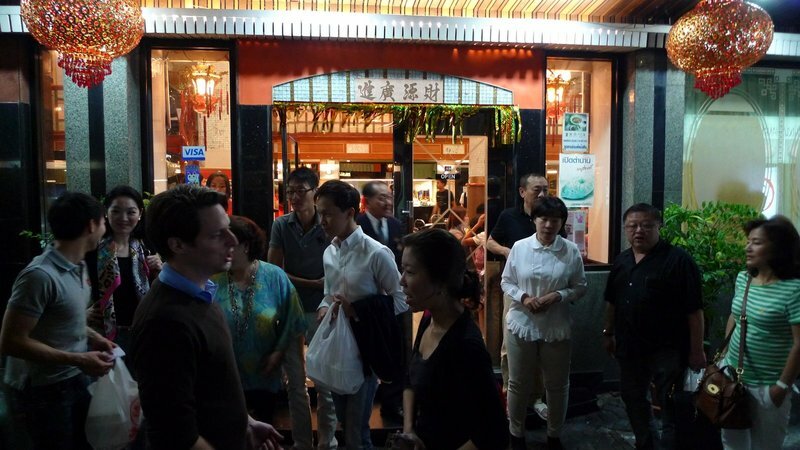 Outside the front of the restaurant, which is located just off Soi Taniya, the adult nightlife street that caters to Japanese tourists and expats. 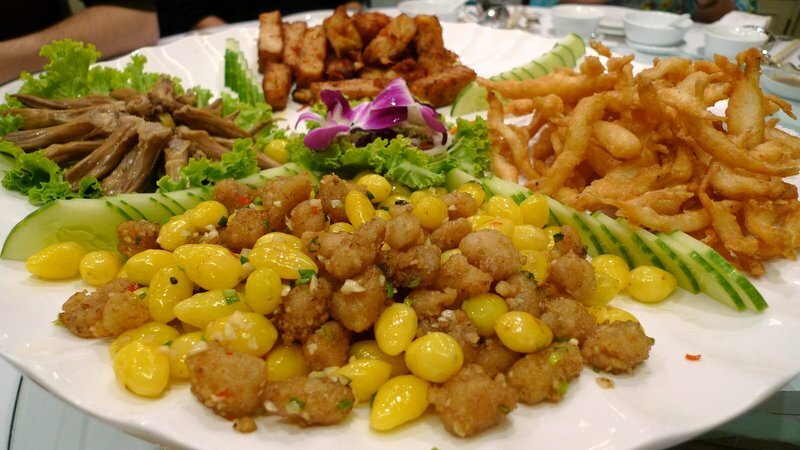 This entry was posted in Uncategorized and tagged Bangkok, banquet, Chinese, Dining, food, Restaurant, Shangarila, Thailand by christao408. Bookmark the permalink. looks so gorgeous..all of them. The food entices me and …kinda made me gag (the mention of tongue and blood)..but I sure would like to eat most of what is shown here. Everything looks very fancy and unattainable here in St Louis. Maybe if I ever go back home and manage to stop by in Bkk..
I’ll have the rice please HE HE! I am kidding with you I love seeing the food. I am not so adventurous with food. Why I went Vegan for awhile. Gave me new food to try without eating something that lived 🙂 ha! Ok the coconut dish looked good! I love eating those small fried fish and duck tongue. haha My sister thinks the duck tongue is gross but it tastes really good. Some really different tastes/textures here. 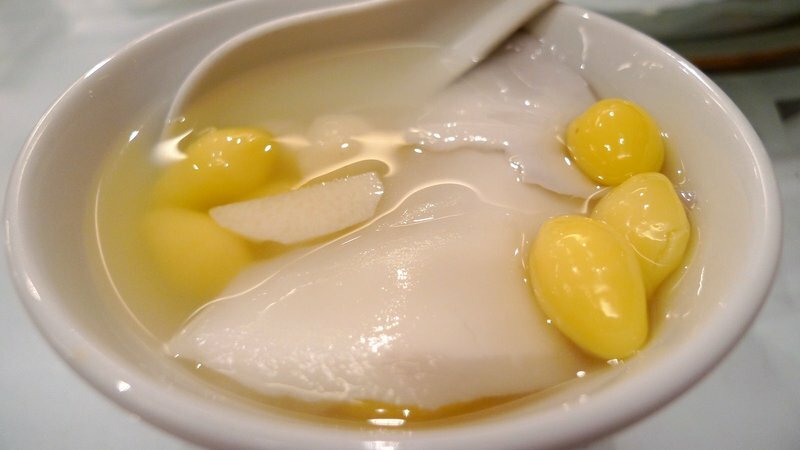 The coconut meat/gingko nuts with sweet syrup reminds me somewhat of the soft tofu in sweet rosewater that we had on Lantau Island at the Buddhist temple. I’m not certain about the duck tongue. I had to swallow a few times to just consider trying that. I’ve never seen a Maine lobster that size. Glad to hear that they use all of the edible parts throughout the meal, though. that looks so delicious! 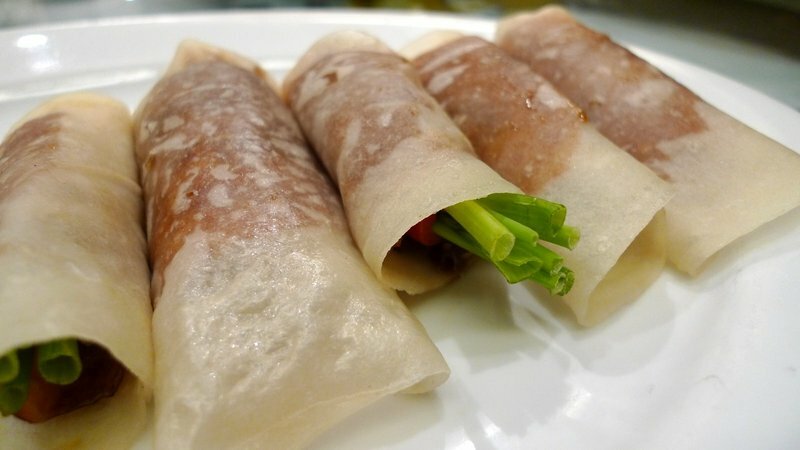 i love peking duck, and i’m sure that was a very good version of it. lobster sashimi also sounds wonderful, although i’ve never tried it. i’m just as confused about the lobster blood with sprite… but i guess it just goes to confirm that we chinese will eat just about anything! I wish I was there! It looks like a sea foodie’s dream!!!! I’ve seen almost all of these dishes before but the lobster blood in sprite is new to me. I am not a big fan of duck tongue, chicken feet, organs, sucking pigeon brains… That is a lot of food and I’m glad you folks took home the extras rather than wasting it. I’m guessing just by looking at the pictures there’s 7, maybe 8 people? I think my family of Thai-Chinese background eat a lot of weird food, but the lobster’s blood gelly with Sprite is just exceptional! I wonder how they draw blood from the poor lobster .. was it still alive? Well my favourite dish is the fried soft shell crab.. yum! That is one nice meal. WOW! That was some meal! Great photos too. Now I need to go have some brunch! oh, I grew up in Burma, next door to where you are, so I am quite familiar with blood, tongue, and all sorts of things. Ate some of them too as a child ..I think I just gotten too far away from the scene and become squeamish. man, that meal looks incredible! 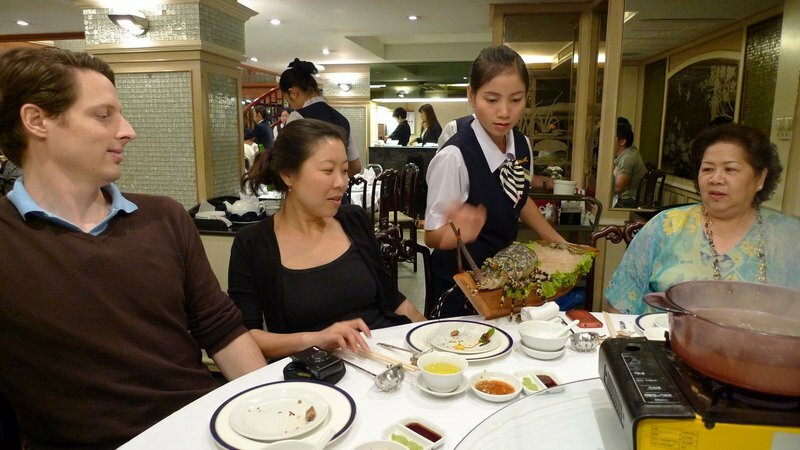 we too have a cantonese style chinese restaurant here in jakarta where they too cook duck tongues (delish!) and serve lobster sashimi. 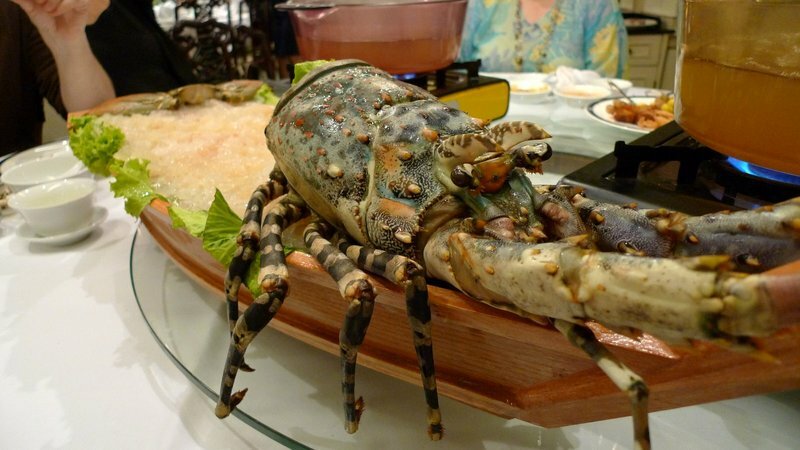 just like the one in your pic, the lobster was big enough to be used for 3 dishes. sashimi was the first, i can’t remember the second, and the third (served as the last course) was my favorite – rice porridge with the head and roe. @rudyhou – They never, ever let anything go to waste, do they? @iskrak – I imagine with Coke you wouldn’t be able to appreciate the blood as much. Ha ha…@LostSock21 – As it was…@awoolham – I’ve heard similar from other people who grew up in cultures that eat more innards. If you spend time away from it, you sometimes start to look at the practice and end up having an, “Eat what!? !” reaction. =D@murisopsis – Lobster blood and sprite for brunch, right? Ha ha… er, no.